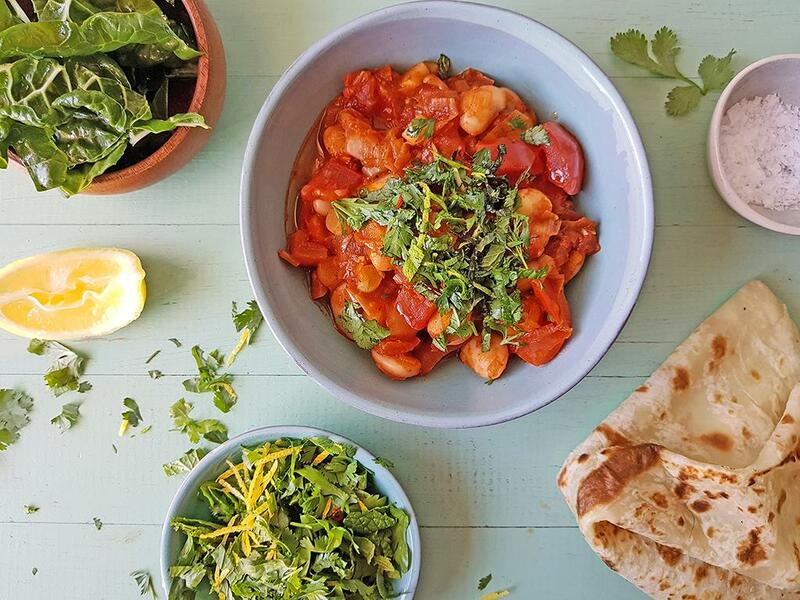 Butterbeans served in a tomato sauce, with Swiss chard and toasted rotis on the side. Lemon: Using the fine side of a box grater, grate the peel of the lemon to create zest. Then cut the lemon into wedges. Set aside. Swiss chard: Using a sharp knife, remove the stalks and slice into 2cm strips. Drizzle with olive oil and season with a squeeze of lemon and salt and pepper to taste. Butter bean mix: Place a pot on a medium heat with a drizzle of olive oil and cook the leek with a little salt for 5 minutes until softened. Add the butter beans, nutmeg, tomato paste, chilli flakes (optional) and 2/3 of the garlic and cook for about 30 seconds. Add the tomatoes and the water (see quantity above for the butterbean mix) and cook for 7 minutes until the tomatoes soften and the sauce thickens. Season to taste. Herb salsa: Remove the mint leaves and chop them roughly. Mix together the coriander, mint, chilli (optional), lemon zest and the REST of the garlic. Rotis: Place a large pan on medium-high heat and dry toast the rotis for 30 seconds a side until golden. Serve the butter bean mix with the rotis and the Swiss chard on the side.